Planning historians all seem to be drawn, sooner or later, to city comparisons. How could we not be? Planning ideas are trans-national things, and observing how and why they are adopted by different national cultures helps illuminate the planning ideas themselves and the cities they shape. But it is also true that, for those of us who think about such things, comparisons are just endlessly fascinating. It was with such thoughts in mind that I, a historian of Toronto planning, recently visited Mexico City, a city I knew little about but had heard other historians speak of with such fascination and reverence that I had to see it myself. It turns out those other historians were quite right. For anyone interested in cities Mexico City is indeed a rewarding place to explore. So rich and complex it is that a week-long visit supplemented by a little reading cannot possibly provide a full understanding. But it is a start. The main over-arching idea that came to dominate my thinking is how much more planned Mexico City is than Toronto or, put another way, how much more planning history there is to see in Mexico City than Toronto – the two being not quite the same thing. Here are some of the observations that led me to think as I do. Atop the list of sights for historically-minded tourists in Mexico City is the centro historico, the extraordinary assemblage of buildings from the time when the city served as administrative centre of New Spain. At the heart of the district is a huge public square, the zócalo, that is bordered on the east by the National Palace and on the north by the Metropolitan Cathedral. But the district includes dozens of other splendid buildings, some dating back to the 17th or even, in their original form, the 16th century, all designed in the European architectural styles of their time. The buildings are spectacular, to be sure, but the planning of the district is equally striking. The rectilinear street grid is the most noticeable aspect; it seems almost modern but in fact was prescribed by the 16th century “Laws of the Indies” that Spain enacted for the development of all its colonies. These laws also clearly shaped the Alameda Central, a rectangular park on the western edge of the district that was designated as public space in the 1590s. But really it is the district overall – laid out as a whole, for function, beauty, and of course as a symbol of colonial power – that most clearly reveals the hand of planning. Satellite image of the contemporary centro historico, from Google Earth. The zocalo (white) is lower right and a portion of the alameda central (green) upper left. Toronto has nothing of the sort, having been little more than a fur trade post while the buildings of Mexico City were being erected in a style befitting a European capital. Not until the 1780s did the British – who acquired the Great Lakes territory from the French in 1763 – make any move toward planting a town on its site. 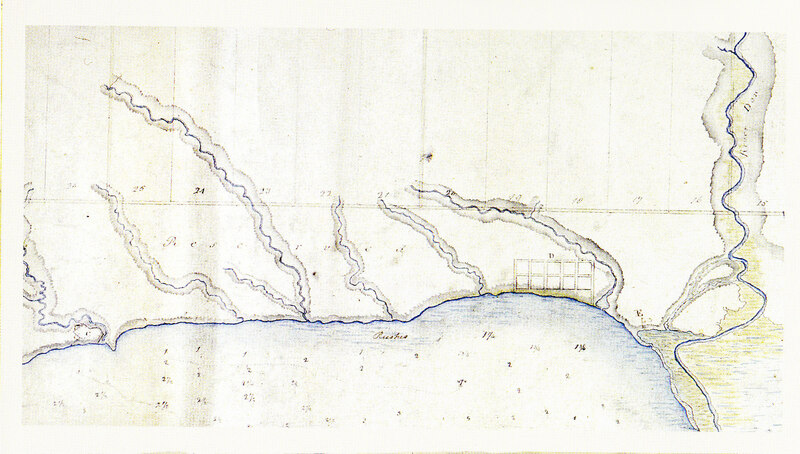 The colonial governor in Quebec City initially issued a rather formal town plan, but this was soon superseded by the modest little ten-block plan – if ‘plan’ is not too strong a word – from which the city grew. It prescribed a rectilinear grid but no land use designations and no buildings. The plan was extended west in 1797, and this with this came a few specific elements, notably the designation of certain lands for public purposes, but it was still far from a fully-conceived town plan. Moreover Toronto, or York as it was called at first, was such a remote colonial outpost that only modest wooden structures were built on the original grid, none of which remain. Those of us who teach Toronto history insist that the ten-block grid itself, which present-day streets still follow, is an important artifact, but listeners have been known to roll their eyes. The planning principles underlying the genesis of Mexico City are hard to miss; those underlying the genesis of Toronto are hard to find. 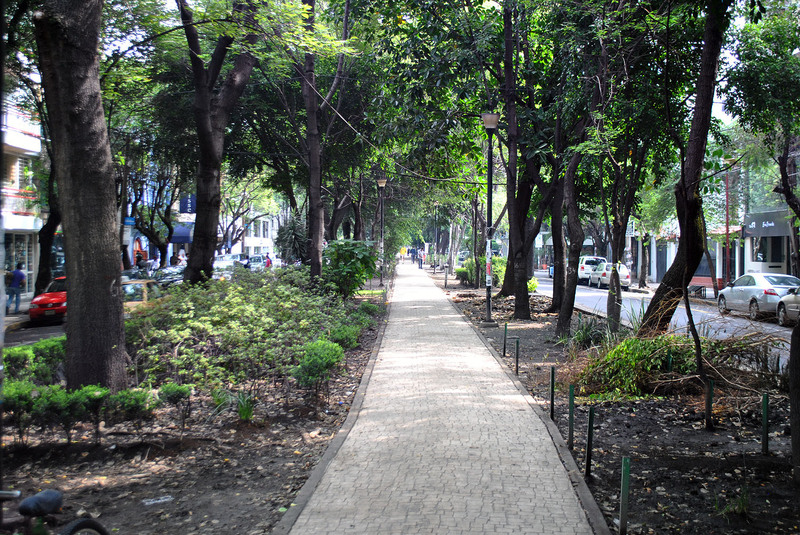 Walking west from the Alameda Central one encounters the Paseo de le Reforma, a wide boulevard running diagonally south-west from the edge of the historic grid. One is immediately reminded of the grand boulevards of Europe, and this is no coincidence for it was laid out by an Austrian military officer in the early 1860s under the direction of the Austrian, but French-installed, Emperor Maximilian during Mexico’s curious, short-lived “Second Empire”. It was meant to be a grand public thoroughfare, and indeed it is, lined now with new skyscrapers and punctuated at main intersections with sculptures and monuments of symbolic national importance, several of them spectacular examples of what is known in Anglo-America as City Beautiful. Those who know Toronto will be reminded of University Avenue, the closest thing the city has to a grand boulevard. Its configuration with a planted central median dates from the 1930s, and its commemorative sculptures of the Boer War and Adam Beck from an earlier time, but most of what one sees on the avenue now was designed and built in the 1960s. The slightly angled non-boulevard portion south of Queen Street was also built in the 1930s to accommodate the growing number of motor vehicles; proposals to make that stretch of the road much grander, one in 1909 and another in 1929, had been killed by a parsimonious city council. University Avenue does its job, but as a grand urban boulevard it barely makes the grade. 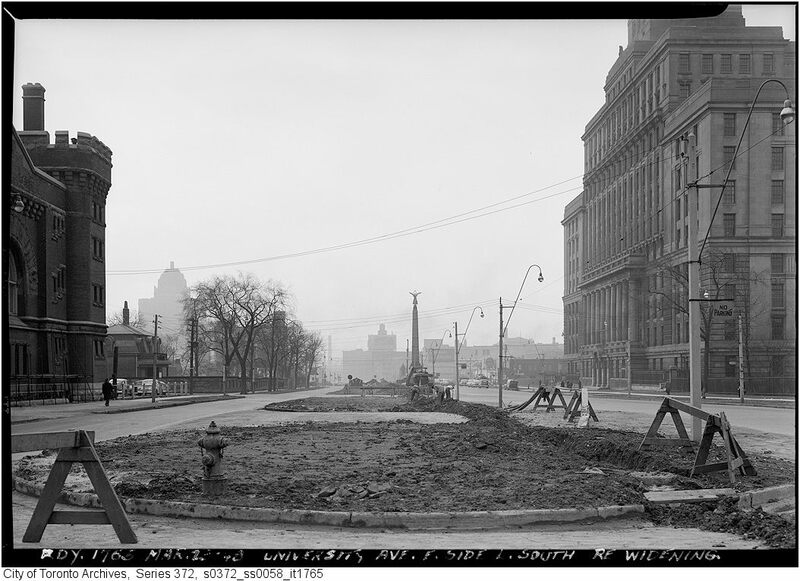 There is not much planning, or design, history to see on Toronto’s University Avenue. On the basis mostly of on-line comments I opted to stay in the Condessa neighbourhood. The area is recommended for its many popular restaurants and bars, which appealed to me, a crime-fearing tourist, because it suggested plenty of street life – which turned out to be partly true but completely insignificant (other neighbourhoods had more street life, and there was no sign of crime anywhere). What I had not expected, although the guidebooks had hinted at it, is what a splendid specimen of early 20th-century planning and design it is. Condessa was developed in the 1920s by a corporate landowner, and it was laid out by an architect, so it is undoubtedly a planned neighbourhood (prior to its development a portion had been leased to a jockey club and its oval hippodrome shaped the layout). But where it stands in terms of planning history is not entirely clear. One recent Mexican analyst portrays it as a garden city. Like most so-called garden cities it might be more accurately called a garden suburb for it was attached to the existing city, but even that is not entirely apt because the neighbourhood is by no means purely residential. Moreover much of its character comes from the formally-designed public gardens and the planted walkway/medians running down the centre of residential streets – all of them resplendent with their high-altitude tropical vegetation – and these are by no means Ebenzer Howard-inspired. But however it is classified it is undoubtedly beautiful, and to anyone with an eye for historic urban landscapes equally fascinating. Avenue Mazatlan, one of the many sidewalk/medians in Condessa neighbourhood. Great swaths of Toronto were built in the generation after the First World War as well, most of it in the form of nondescript bungalows on grids of streets. Even the more truly designed areas from that era like Forest Hill, Leaside, or Kingsway Park, show scant novelty in their housing design, use of urban space, or mix of land uses. A planning historian could walk for hundreds of blocks through Toronto’s interwar neighbourhoods without seeing much of interest. What they would see is evidence of an increasingly affluent city with conservative Anglo-American tastes, run by a municipal government that was wary of over-taxing and reluctant to interfere in private residential development. They would see, in other words, the essence of interwar Toronto, but not much planning history. There is so much more to Mexico City’s planning history – the extraordinary radial pattern of the federal district, the modernist postwar suburbs, the disruptions caused by transportation infrastructure construction, and the recent New Towns on the urban edge – but this piece is already longer than it should be. Toronto is a fine place to live, but Mexico City is far more interesting to a planning historian. Has anyone ever said otherwise? Probably not, but it seems worth saying nonetheless. SOURCES: Mexico City itself is the main source for this piece, but my thinking was stimulated by a blog on the “Polis” website, written by Jordi Sanchez-Cuenca, noted below. Details about the Condessa neighbourhood were drawn (as best I could with my limited Spanish) from Manuel Sanchez de Carmona, “El Trazo de las Lomas y de la Hipodromo Condesa”, Diseno y Sociedad, Spring/Autumn 2010.